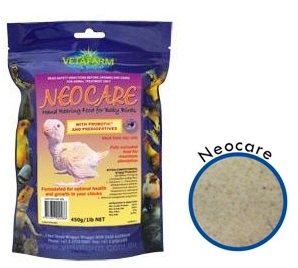 Neocare is Vetafarm's specialist neonate food, formulated with predigestives and probiotics to ensure babies get all the nutrition they need to grow into super hand-reared birds. Neocare follows nature by providing a form of "crop milk", essential for the well being of incubated babies and is a great help for those you pull from the nest to hand rear. Because crop milk is fairly similar for most birds, Neocare is suitable for the species we commonly hand rear including parrots, cockatoos, finches, canaries, pigeons and doves. Neocare should be used as the sole food for hand rearing. ***Kristen Reeves has tested just about every hand-feeding formula on the market. She has found Neocare to work best for a wide variety of finch & canary species due to its high protein content and smooth consistency. Once mixed, it comes up even the tiniest of syringes with ease and can be mixed to any desired consistency. She has had excellent success hand-raising even insectivorous chicks on this formula and highly recommends it for all finch & canary species. Recommended for: All avian species as a complete hand rearing formula. Suitable for use from hatching through to weaning. Can use with: Neocare should NOT be used with any other supplement unless advised by a veterinarian. Neocare is a veterinary balanced food, mixing other foods or supplements will dilute the nutrition and unbalance a young birds diet. If hand feeding from hatching, an electrolyte formula should be fed for the first 24+ hrs or until the bird passes its first dropping. Neocare is then fed at a runny consistency and thickened over a period of days. Key features: Extrusion cooked for safety and increased digestibility. Contains Probotic to promote healthy gut flora. Contains Pre-digestives to increase gut efficiency and ensure maximum absorption of nutrients. 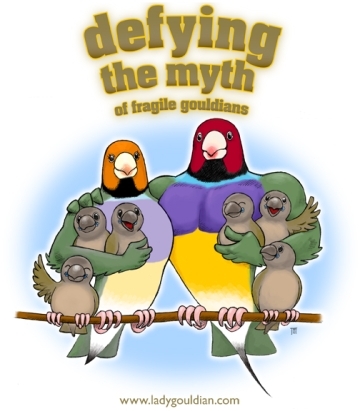 Scientifically balanced to ensure precise nutrition in baby birds. Contains all necessary vitamins, mineral, calcium and amino acids for growing bones, organ function and strong feather development. Isolated soy protein, oats, corn, vegetable oil, calcium carbonate, vitamins and minerals, Probiotic and Predigestives. Safety Directions: Avoid contact with eyes. Storage & Disposal: Store in a dry area below 25 degrees celcius (air conditioning) out of direct sunlight. Dispose of empty packaging by wrapping with paper and placing in garbage.